Statins and angiotensin receptor blockers at therapeutic doses have beneficial cardiovascular effects, which can be applied for cardiovascular protection. We explored whether low doses of atorvastatin, losartan, and particularly their combination, possess important pleiotropic vasodilatory effects. Wistar rats were treated daily with low-dose atorvastatin (2 mg/kg, n = 15), low-dose losartan (5 mg/kg, n = 15), their combination (n = 15), or saline (n = 15). After 4, 6, or 8 weeks the animals were anesthetized, blood samples taken, and their hearts and thoracic aortas isolated. 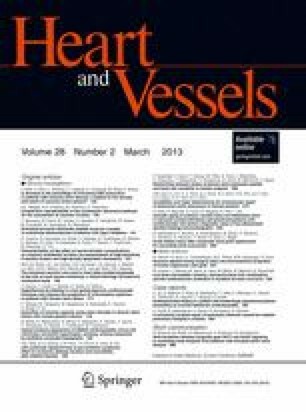 Two kinds of experiments were performed: the measurement of coronary flow rate after ischemia/reperfusion myocardial injury and endothelium-dependent relaxation of thoracic aorta. In both models, maximal vasodilation activity was obtained in rats treated for 6 weeks. In the ischemia/reperfusion myocardial injury model, coronary flow increased (atorvastatin or losartan 1.9-fold, P < 0.01; combination 2.4-fold, P < 0.001) compared with controls. In the thoracic aorta model, endothelium-dependent relaxation significantly increased only in the combination group compared with the control group (up to 1.4-fold; P < 0.01). Simultaneously, we detected increased anti-inflammatory activity and increased nitric oxide concentration, but no changes in lipids and blood pressure. In a rat model we showed important vasodilatory activity of low-dose atorvastatin, losartan, and particularly their combination. The effects of the low-dose combination were accompanied by, and probably at least partly achieved by, anti-inflammatory and nitric oxide pathways. Overall, these results could be valuable for the development of new vascular protective strategies focusing on a low-dose regimen of statins and sartans, and particularly their combination. The present study was supported by the Slovenian Research Agency, Ljubljana, Slovenia (research project L3-2293). The authors declare that there are no conflicts of interest.